You've done it! You've completed your Race for Life. 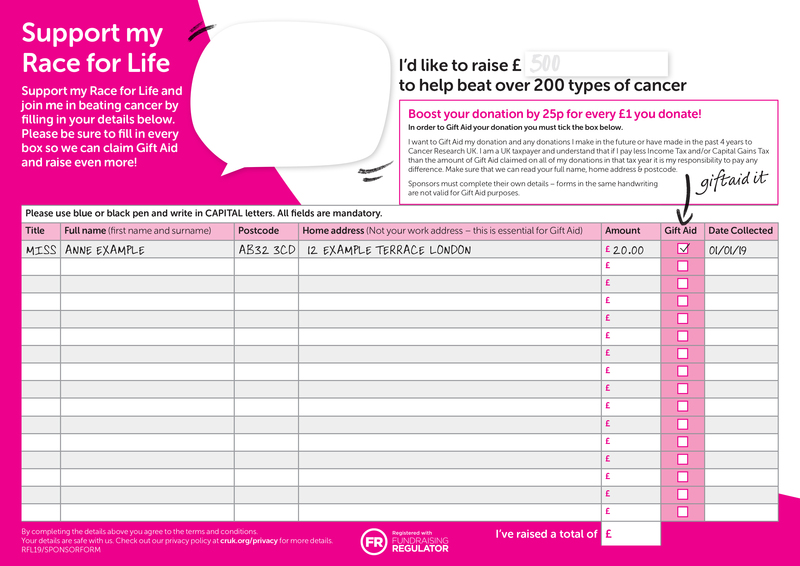 Make sure you return all the money you've raised - every penny helps us to beat cancer. The simplest way is by using your Cancer Research UK Giving Page. It's easy for your friends and family to donate and you can easily keep track of how much you've fundraised. Your sponsorship will automatically be sent to us too - you don't need to do anything. If you haven't already set your page up then you can using the link in the email you received after signing up. If you’d rather talk to someone in person you can pay with your debit or credit card over the phone by calling us on 0300 123 0770. Take your completed support form along to one of our shops and pay in your money there - you can pay by cash, cheque or card. If you have a JustGiving page then Gift Aid will automatically be added to your total. If you are paying your fundraising online, by phone or cheque then we can only claim Gift Aid if we also have your support form. By sending in your support form, we will be able to claim at least an extra 25% to every donation at no extra cost to you. Please send your support forms to the address above. What payment types do we accept via post? How long does it take to process a cheque? 4-6 weeks at peak times: 1 week for the cheque to be received and sent to the bank, a further 5-7 days for the cheque to clear in the back, and a further 2 weeks for a thank you to be sent out. What happens if my fundraising gets lost in the post or is not received? At peak times it can take up to 4-6 weeks for cheques to be processed, if the cheque has not been cashed after 6 weeks, you may need to cancel the cheque and re-issue it. Is there a time limit to when I should send my fundraising back by? We do encourage our participants to send their fundraising back to us as soon as possible so that the money can be put towards our live-saving work quickly. However, there is no strict cut off as to when you should send your fundraising money back to us and we welcome donations all year round. We receive no government funding for our research. Our life-saving work relies on the money that you raise through sponsorship. It is from the support through events like Race for Life that helps us continue our groundbreaking work and help more people survive cancer. Cancer Research UK scientist, Professor Richard Gilbertson is one is one of the world's leading childhood brain tumour experts. This video shows some of his latest research on the ‘perfect storm’ of conditions that can lead to a cell developing into cancer.